So, weeks ago I resolved not to watch the movie adaptation of TFIOS in the theater; but then this amazing opportunity came to me that I will never want to miss. Through Ratri @ The Awesome Nerd, I was invited to participate in DetEksi Jawa Pos bookclub discussion about The Fault in Our Stars - which included watching the movie together beforehand. I excitedly accepted the offer, and finally got to watch the movie adaptation of a book that I love so much. It's been almost a year since I read the book, so I can't remember small details - but I'll do my best to compare the book and the movie adaptation. So here's my review on the movie adaptation for The Fault in Our Stars. The movie is narrated by Hazel Grace, giving the audience an introduction to her life and about dying because of cancer. Her mother thinks she's depressed so she was sent to a support group who has a group of people with cancer - sharing each other's experience. And there she bumps into this boy, Augustus Waters, who kept staring at her the whole session. And that's where it all begins. I probably won't go into the plot any further, just to avoid spoilers for those who have not read the book or see the movie yet. But I would say that, even though the movie adaptation made several alterations - most probably because of the duration - it still stayed true to the original story. First thing, I've got to say that Augustus' smile kills me - right from the start. He's a boy full of charms, and definitely has a very likable personality. Both Hazel and Augustus's chemistry flows very naturally; I can totally see how Hazel is also interested in Gus - especially when she waited for him to call or text her by constantly checking her phone. That's a great start for the movie, because I think without the chemistry, the movie adaptation wouldn't do justice to the book. Now let's talk about my favorite scenes from the movie, which I know will be so difficult to choose because I love almost everything about it. And because I have so many, I will just make a list. The metaphor. Oh God yes. When Gus started taking out a cigarette and putting it between his teeth, I'm already smirking like a stupid person because I know by heart what he's going to say next. This mindset of his is always the most adorable thing about Gus, for me. Their phonecalls. And maybe just because I love how Gus answered Hazel's calls. I think this also includes their text messages. As I've said earlier, these scenes are what builds their chemistry in the movie. I can see how their relationship naturally grows from friendship into something a lot deeper. When Gus prepared all things related to Amsterdam for Hazel; bringing her tulips, wearing Dutch jersey, eating Dutch food for picnic. I like this just because Gus looks super cute with that jersey on, and him trying to give some hints to Hazel about their trip to Amsterdam is just the sweetest thing ever. When they're sitting on the old swing set, and Hazel trying to keep some distance and staying just friends with Gus - but Gus said all those quotable, meaningful words, that I want to keep repeating in my head. "You realize that trying to keep your distance from me will not lessen my affection for you. All efforts to save me from you will fail." When they had dinner in Oranjee; it was when Gus openly confessed his love towards Hazel. Hazel and Isaac's speech. This part totally made me cry; it also made me cry when I read the book. I'm glad the dialogue in the movie doesn't make much changes to this part. Such a beautiful yet heartbreaking scene. I love Isaac's speech that is full of jokes, but I can totally feel how he treasures Gus as his best friend. "Some infinities are bigger than other infinities. A writer we used to like taught us that. There are days, many of them, when I resent the size of my unbound set. I want more numbers than I'm likely to get, and God, I want more numbers for Augustus Waters than he got. 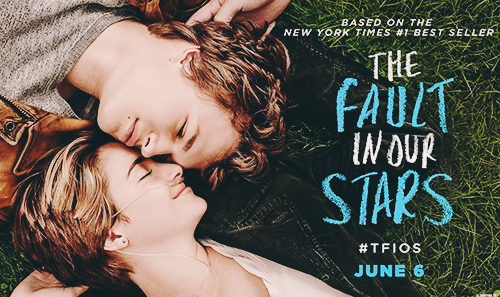 But Gus, my love, I cannot tell you how thankful I am for our little infinity. I wouldn't trade it for the world. You gave me a forever within the numbered days, and I'm grateful." Another thing that I want to talk about are the casts; well basically the most important characters in the movie are Hazel and Gus. And I think Shailene Woodley and Ansel Elgort are perfect for the part - especially Ansel. For me, he's the perfect cast for Augustus Waters. Ansel Elgort portrayed Gus's personality right off the book; he's totally like what I imagined as I read - that's why I am super satisfied. Same goes for Shailene, I think she's able to portray Hazel's strong character very well (probably because she's a Dauntless. ㅋㅋㅋ sorry, wrong movie). Another cast that I want to discuss is Nat Wolff, who played Isaac - Gus's best friend. Even though he doesn't show up much in the movie, he leaves a pretty good impression because he kind of lightens the mood with a pinch of humor. But as much as I enjoyed watching the movie adaptation, I have my own disappointments. Compared to the book, I feel like the movie is less emotional. The book was an absolute roller-coaster ride of feels. Not only on the romantic side, but also about the family relation and friendship and also the character development. I'm quite sad because Hazel's parents didn't get much attention - especially Dad. And Dad's final dialogue made me cried hardest in the book, but in the movie adaptation it was totally flat. But I guess the movie had to focus more on Hazel and Gus's relationship, so they had very limited time to cover the other side stories. And most definitely, the movie adaptation cut out several scenes and dialogues in the story (that I won't really mention one by one, to avoid spoilers) - which is normal for any movie adaptation, but am still a tiny bit disappointed.